Debut album by this Turners Falls-based quartet led by Adam Langellotti of Sore Eros and widely hailed for his engineering work. The sound on Transient Response is languid ruralist prog-pop, with help from Gary War, Ma Turner, Shannon & Beverly Ketch, and other Valley travelers. New Parents can be pretty raw live, but the overall vibe here is smoother and distinctly out-of-time. Different segments remind me of everything from Fraser & DeBolt to Brinsley Schwarz to Great Plains and back again. Something about the way the production is layered gives the record a feel quite redolent of the early ’70s, but the more you play it, the clearer its contemporary origins become. Amongst the classic rock instrumental touches there are short bursts of weirdness that telegraph a 21st Century post-whatsis aesthetic as clearly as a skunk broadcasts stink. Jenifer Gelineau’s violin work is an extremely important part of the tunes on which it appears. Her work here has a texture that binds Adam’s voice and words to a point that looks forward and backwards in equal measures. Without it, I feel as though the album would have a certain wobble to it. Her fiddle is the gyroscope at the center of things. 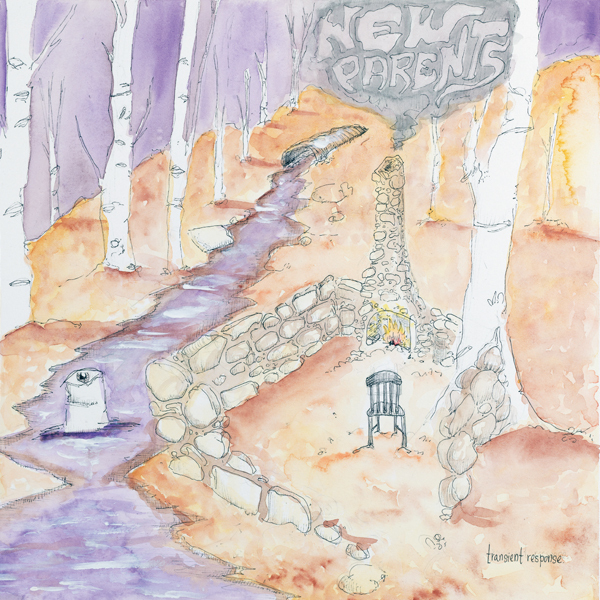 The fact that Anthony Pasquarosa did the cover art and Lee Ranaldo provided the insert photo are indicative of the company New Parents keep. Both of these cats are a hard-to-define mix of traditional and moderne components. The same is true of Transient Response. And to those bitter orphaned critics who are bound (by law) to call this Dad Rock, I would hasten to correct them. It’s Mom and Dad Rock, and if you can’t dig that, your chances of ever hooking up with a real family are just about nil.